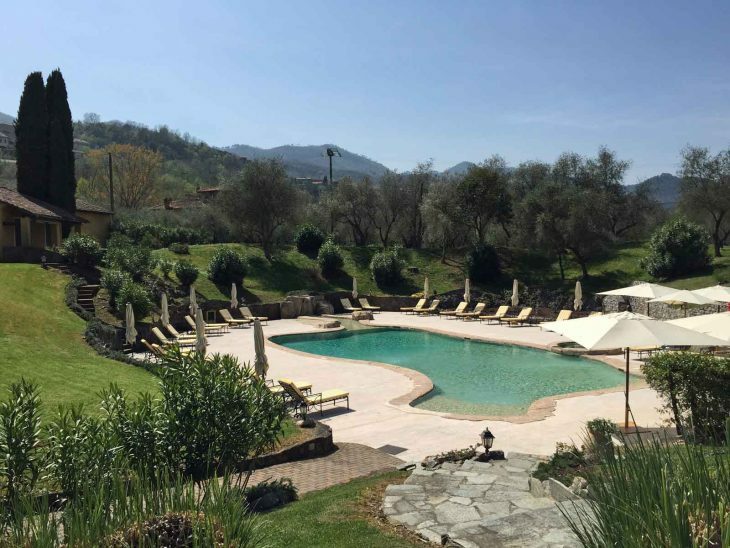 Are you looking for a holiday destination where you can play golf, go horseback riding, explore ancient villages, Roman ruins and the beach on the Italian Riviera is only 10 minutes away? Are you looking for a well-run, cozy hotel with excellent food? I am pleased to offer a solution to both questions and the answer is La Meridiana Resort in Garlenda. I recently visited La Meridiana Hotel in Garlenda and enjoyed my stay immensely. Please continue reading to find out why I enjoyed my stay. Panorama of hotel and pool at La Meridiana Resort. Getting to La Meridiana Resort. La Meridiana Resort is located between Monte Carlo and Portofino, beautifully situated with a great view of the mountains. The closest airports in Italy are Genoa (about 1 h 15 min drive), Torino and Milan (about 2 h – 2 h 30 min drive). I flew in to Nice and drove for about 1 h 45 min to reach La Meridiana Resort. This trip I focused on Italy, but I love the idea of combining France and Italy. Also easily combined with Tuscany by car. If you are flying in with your own plane you have Villanova D´Albenga Airport 10 minutes from the hotel. Villanova Airport is an excellent alternative if you want to visit Cannes or Nice but has become tired of queues and expensive landing fees. A helicopter from Villanova will whisk you to Nice in no time. In addition, you can drive your car almost all the way up to the airplane at Villanova Airport. The resort offers 27 rooms in total in different categories with AC and individual temperature control. What is good to know is that dogs are welcome in the rooms with tiled or hardwood floors. Naturally doggy biscuits and a fresh bowl of water will be provided for your pet. Dogs are also welcome in the lobby and the restaurants on a leash. You will have all the standard amenities you can except from a well-run hotel, including hairdryer, bath robe, slippers, mini-bar and so forth. Classic and Superior Rooms are similar except that the Classic´s bathrooms are not refurbished. As I have understood the situation, there are only 2 Classic Rooms as of April 2015 and these will soon be turned into Superior rooms. Panorama from one of the rooms at La Meridiana Resort. All rooms and most public areas have Wi-Fi. The hotel states “most public areas” but I could not find any place indoors where I did not have Wi-Fi connection. Just 6 km away you find the charming town Alassio with a great climate and excellent beaches. As all Italian coastal resorts, the beach is busy and full of people in high season. Personally, I prefer going to the beach before or after the peak season. There has been instances where temperatures about 18 – 20 C has been recorded in December on the beaches of Alassio. Even if you are not a beach person Alassio is well worth a visit. Alassio beach pictured in April 2015. If you want to experience more beaches, you can also pay “La Baia Del Sole” (The Bay of the Sun) a visit. The owners live on the premises and are genuinely interested in gastronomy. Edmondo Sagre has an extremely good understanding of quality and spends lots of time finding the right produce to prepare and serve his guests. The wine cellar boasts more than 12 000 bottles of good quality, selected and collected during 20 years. I tried both restaurants during my stay and I was very pleased with both quality, preparation and service. Il Marino is the gourmet restaurant and only open for dinner. Here you will be able to enjoy a menu made from local produce and prepared with care and love by the chef. Informal restaurant, open for lunch all year and for both lunch and dinner in the summertime. Specialised in Ligurian cuisine. Il Bistrot can also provide lunch by the beautiful pool if you wish. There is a plethora of activities to choose from and the staff will be happy to assist with almost anything. Guests are welcome to borrow mountain bikes at the La Meridiana Resort. It is a varied and exciting terrain and you can easily combine ancient villages and seaside in the same mountain bike trip. The yacht harbour in Alassio is only 6 km away which opens up for all types of nautical experiences. There is an 18-hole golf course on the premises. This is an English golf course which means that it is built around existing nature as the opposite to an American course which is far more constructed and custom built. If you want to brush up your skills there is an English speaking Pro at the club, offering lessons at 25EUR per 30 minutes. Naturally, you can rent both clubs and carts. The best part is that you are allowed to play as many rounds as you like during a day for the green fee. This is a trekkers Mecca where you can explore ancient villages, Roman ruins, stunning landscape and breath taking scenery. If horses and riding is your thing, there is a stable adjacent to La Meridiana Resort. If you want to relax in the sauna or have a massage you can do so. Budget about 50EUR for a massage, which in my opinion is very affordable for a hotel. MICE at La Meridiana Resort. Even if La Meridiana Resort has no conference rooms per se, you will definitely be able to host a successful conference. You will be able to have your meeting in one of the restaurants, by the pool or in a tent in the garden. Everything depends on the purpose and number of participants. The hotel will be happy to tailor all types of team building exercises for your group. The best thing is that there is not much around which means that there are no temptations “on the town”. Sometimes this is a problem in big cities where the participants tend to wander off on their own after dinner. Once again, the management and staff is very accommodating and working hard to make every stay memorable. Tell them (or your travel agent) what you want and you will see what opportunities are available. I would not hesitate to recommend this to a group who is looking for something a little different. La Meridiana Resort was one of the highlights on this trip. I liked the tranquillity at the hotel with lots of interesting possibilities around the corner. Food, vibe and service is without a doubt 5/5 stars. Rooms and other hardware is 4,5/5 stars. Please do not take this as something since the pricing reflects this well. A helpful article I wrote on how to get the best from your travel agent. You might also want to read a few tips on meetings by a professional meeting planner. Do you have questions or experiences of La Meridiana Resort in Albenga? Did you like this review of La Meridiana? Please let me know via email, in the comments below, on Twitter, Facebook or Google+.